This in an intricate case on land rights and nature conservation. We focus on the recent "carbon credits" deal between the state of California and the state of Chiapas. In 2010 the government of the Mexican state of Chiapas signed an agreement under the Governors’ Climate and Forest Task Force (GCF) in order to sell carbon permits from REDD projects in the Lacandon jungle to the Government of California to offset their emissions. Lacandon jungle is one of the best preserved and a biodiversity rich forest in Mexico with a long history of conflicts over land rights. In the 17th century the original inhabitants were killed or left the area escaping slavery and the jungle was inhabited later by migrants from Guatemala and Yucatan. In 1972, 614,000 hectares of land was donated to 66 Lacandoneses and was declared as The Montes Azules Biosphere Reserve. This was questioned by settlers. Donating the land title was seen as a government strategic move to easily get signed consent for timber logging or tourism activities, and more recently REDD+ and carbon trade credits. This has added to the existing chaos of overlapping land titles of original no-Lacandones communities. In 1994 a new actor appeared, the Zapatista Army of national Liberation (EZLN) movement. The Lacandoneses communities were paid $2000 pesos (approximately $160/month), derived from a vehicle tax within Chiapas, for implementing the REDD+ project. 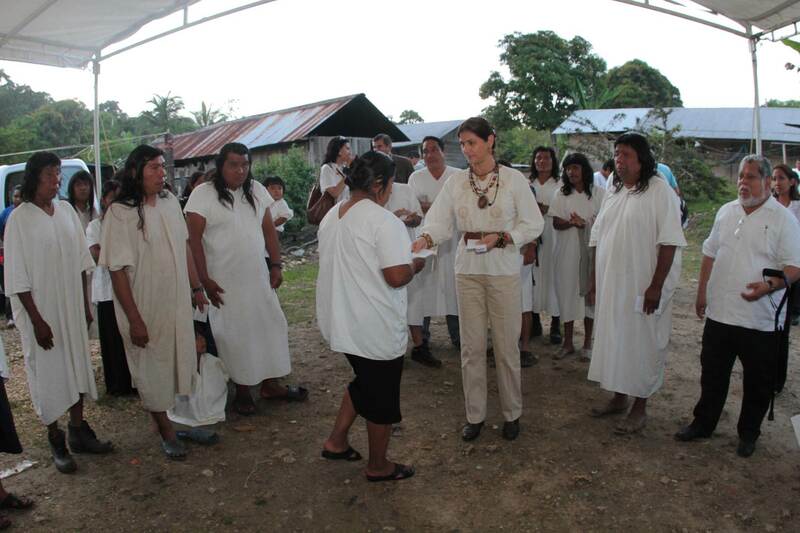 The group of original inhabitants, only 6% of the population of Lacandona, have opposed the project that resulted in cancellation of the health service in the community and raising threat of armed conflict with surrounding Lacandones. Besides this, in order to pave the way to African oil palm plantations for biofuels in the areas surrounding the REDD+ pilot (Government programme of productive land reconversion- Reconversión Productiva), the government of Chiapas was planning relocation of the communities to “Sustainable Rural Cities” (in a movement paralleled also in Honduras), claiming that this would provide them with better life conditions. The opposition was particular strong in Amador Hernandez known as a centre of the resistance of Zapatistas army. The communities oppose the unilateral delimiting of the agrarian border of the Lacandona community (Brecha Lacandona-) and in a response to the pressure organised self-determined own health system based on their traditional medicine, and started sharing the information with the wider public. In 2012, the representatives of the territory of Marques de Comillas spoke on GCF meeting even though their official request to speak was refused. The group of international and national organisation united through the Global Justice Ecology Project start circulating their communication and sign-on letter against REDD+ written by the community of Amador Hernández. The local people call for respect of rights and knowledge, life style and territories of local and indigenous people, but not through the conservationist programs of PES (payment for environmental services) and palm plantation. A government effort to further exploit Mayan history and construction of superhighway to make more accessible archaeological zones led into violent conflict with local communities, when several people got killed and many arrested. In general, REDD+ was criticized for not addressing the real problem of GHG emissions, and for bringing the profit to the big companies only and not to the local people. 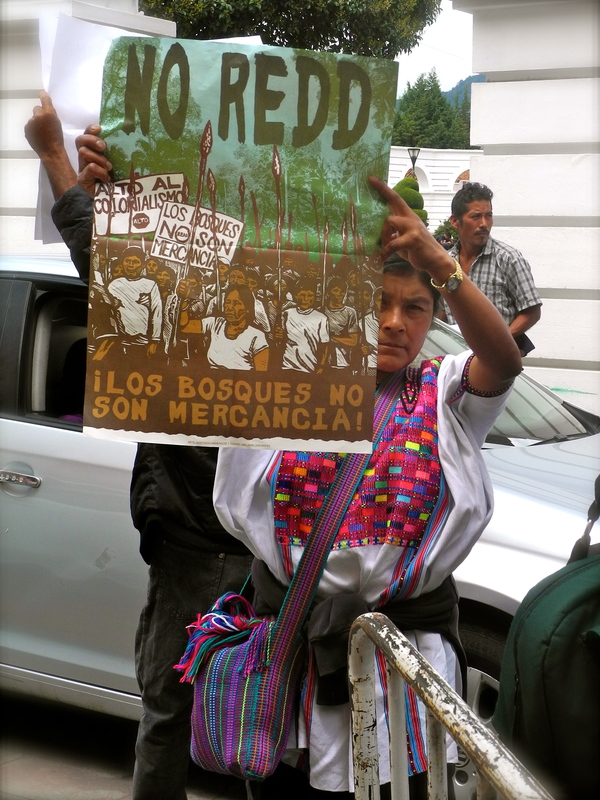 In particular the REDD+ project in Lacandona was criticized for promoting privatization and commodification of the nature, disposition of local people land rights making them leave their forests and giving the way to the international biopiracy. In 2013, dozens of local civil society organisation from Mexico, and group of international NGOs including Friends of the Earth, Greenpeace International, Global Justice Ecology Project, and the Indigenous Environmental Network sent two separated letters to California governor asking him to reconsider and stop the agreement with Chiapas. Beside the government of Chiapas other non-governmental international sector have been particularly active in this case such as Conservation International (CI), World Wildlife Funs (WWF) and The Nature Conservancy (TNC), as well as academic institutions El Colegio de la Frontera Sur (ECOSUR), in charge of calculating the baseline for the implementation of REDD+ and training local people to do land based monitoring. Besides, ECOSUR led a project to classify the species called International Barcode of Life, that is recognised by local community as a huge risk of bio piracy, particularly if they are made to leave their forest, which would give free way through to the big pharmaceutical companies to use their natural resources. In 2012, ECOSUR distanced from the project, and pointed out the project is not part of the national REDD+ readiness process they have continue being part. In 2013 newly selected Minister of Secretary of Environmental protection and Natural History of Chiapas (SEMAHN), Carlos Morales Vázquez, cancelled the project, explaining it is was not successful in addressing the root causes of deforestation, and for endangering the lives and livelihoods of indigenous peoples. He also stressed that REDD+ pilot was not part of the advance national REDD+ readiness process. Within national REDD+ process, state of Chiapas is recognised as early activity- the initiatives designated by the government in order to collect the experience on development of institution and technical base for implementing the Mexico’s national REDD+ strategy (ENAREDD+). ENAREDD+ has been designed in parallel to this process and it’s expected to be published and consulted with local people over 2014. Project Details Each person gets 2,000 pesos or 160 dollars monthly for keeping its forest. The carbon credits are sold by the state of Chiapas to the state of California. Development of Alternatives National and international CSO demanded cancellation of the REDD+ agreement among Chiapas and California. Local people are rejecting REDD+ in any of its forms. Why? Explain briefly. Even though the REDD+ pilot was suspended, the Action Program on Climate Change in Chiapas (PACCCH) continues to refer to REDD+ as a keystone of the state’s climate change strategy, indicating that the project could be implemented as a part of the ENAREDD+ in other areas, such as the natural protected areas El Triunfo and El Ocote in Sierra Madre region. According to the Mexican government and ONG sector working on a design of ENAREDD+, it would include solid social safeguards that will guarantee the local people rights to request implementing REDD+ under their conditions or to reject its implementation. This has yet to be seen. ¿Conservación de la naturaleza o especulación y despojo? Stop the Agreement between Governments of California, Acre and Chiapas! ¡BASTA DE REDD+ Y DE ECONOMÍA VERDE! La Madre Tierra no se vende, se ama y se defiende The letter of local CSO from Chiapas to Governor of California. International NGOs Letter to Governor of California. In this letter international NGOs ask the Governor and Pubic Administration of California to reconsider the agreement with Acre, Brazil and Chiapas, Mexico.